Fully Weaned Hand Reared Baby Female African Grey 1 Year Old Looking. 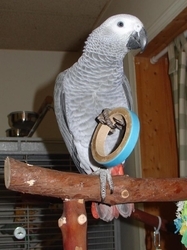 Reluctantly I am looking for a new home for my much loved femaile African Grey Lola. This is due to a change in my own personal circumstances and no fault of Lola'sI have had Lola since she was a baby when she was hand reared.Lola is a real character an excellent talker and very cleaver too.